Saturday Spotlight is a new feature where I'm showcasing some of the books I've reviewed for The Bookbag by posting reviews here for the first time. I'm trying to use it to promote books which people may have missed originally. This is a fairly recent release but I'm fast-tracking it here for two reasons - author Ellen Richardson has been kind enough to give me an interview, which will be up on the blog on Tuesday, and I'm also really excited about the coming sequel Whale Song which is due for release in July. Elly’s been sent to stay with her Aunt Dina for the whole summer, over on Sunday Island. She’s hoping for fun, friends, and happiness. Mostly, though, she’s just glad to be in a place where people don’t pity her because of her mum’s death. When she receives a mysterious invitation to a midnight meeting, she sneaks out and meets two other girls her age, and the trio quickly become firm friends. Then they make a discovery that could change everything – can their friendship survive? Appropriately enough given the title, this is a real charmer of a book. It’s fairly slight, and at times rather predictable, but it’s well-written, beautifully laid out with repeated small illustrations peppering the pages, and features a really sweet central trio. I liked all three of them although I think my favourite was the fashionable Sierra. Having said that, Tash’s dog Mojo is a complete scene stealer most of the time he’s on the page! I actually thought when reading this one that it felt rather timeless – although the language is fresh and up to date, the basic concept is something I could imagine Enid Blyton writing about. (I know Blyton can come in for criticism so should probably stress that’s a compliment!) The location on Sunday Island definitely feels like a ‘classic’ kind of setting, while the messages sent back and forth via Mojo made it a much more unique read than mobile phones or e-mails would have done. It’s also very accessible to children who don’t read that much normally, with the chapters being relatively short and the language used being mostly fairly simple. This is definitely one that I’d press on a reluctant reader, although that’s certainly not to say that children who are addicted to books can’t also find a lot to enjoy here. The dialogue holds its own as being especially good, while the story is enjoyable despite it being reasonably easy to guess how things will end up. 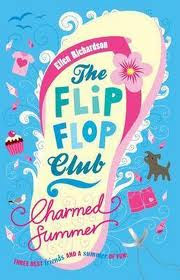 High recommendations for tweens and young teens and I’m certainly looking forward to reading the other books in the Flip-Flop Club series!